As covered in Early History of Jointers, the modern jointer was patented by Climer and Riley in 1866. Before that, many attempts were made to produce an effective machine to flatten the faces of boards. The earliest woodworking machines were sawmills that reduced a log to rough-sawn boards. The next most labor-intensive process in producing finished lumber was surface planing, which produces boards that are reasonably smooth and of consistent thickness. The first surface planers were mainly used to produce flooring and clapboards, because these products could be produced directly from rough-sawn lumber with no need to flatten them because these thin softwood products are held flat when they are nailed into place. Still, it was desirable to mechanize the process of producing surfaced hardwood and thicker lumber, where flattening a face is mandatory. The history before 1836 is incomplete because of the U.S. Patent Office fire in that year. A few of the older patents have survived. The very most important patents were restored after the fire, and a few more-or-less random patent specifications were discovered in the papers of their inventor or the inventor's lawyer. Since (barring extensions) any patents before 1822 had already expired, little effort was expended in restoring them. 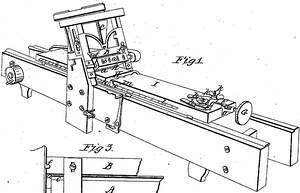 In 1806, Joseph Mott of Vermont patented a machine for planing boards out of wind. Mott's planer used a fixed-knife cutterhead that is essentially a hand plane suspended above the board to be planed. The board is dogged to a traveling carriage, which is the only part of the planer that is powered. Mott's planer would have been only partially effective at flattening boards because the action of the cutter would push the board downwards while it was being cut, and it would spring back afterwards. There is no record of Mott's planer having been manufactured commercially. And the world does not know, and perhaps never would, should the fact not be chronicled here, that at this early period, and in this far-off forest-wild, one of the inventions of world-wide utility was discovered. The planeing-machine (improved and utilized since, and now so indispensable) was invented by Joseph S. MOTT, of Alburgh. After much study and patient application, he brought out his model, and sent it to the Department to obtain a patent; but delay ensued, his model was stolen, and he never obtained a patent. Subsequently, aided by his brother Ephraim and James STORM, he commenced operating a planning-mill in the city of Albany by horse-power; but owing to some imperfection in the machinery, the power was found insufficient, and the enterprise was abandoned.—The parties were nearly ruined by this failure—specially STORM and Ephraim MOTT. A patent was, in fact, issued, and the planing machine is generally recognized to have been invented in 1791 by Samuel Bentham in England. It is possible that Mott arrived at the idea independently, but he was not the first. The first commercially successful machine for flattening the face of a board was the Daniels planer. J. A. Fay & Co. The Daniels planer was an enormously successful design. It was partly obsoleted by Climer and Riley's 1866 invention of the modern jointer, but even after that time the Daniels planer was used for certain specialized tasks, such as planing masts and other timbers too heavy to feed across a hand jointer. Richardson, Meriam & Co. manufactured a Daniels planer until the end of World War I. Even so, only a small handful are known to have survived to the present day. 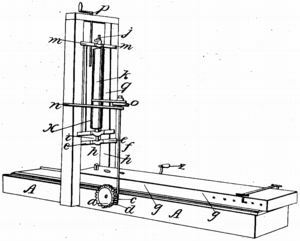 In 1854 Solomon S. Gray was granted a patent for a machine for planing lumber out of wind. The machine was similar in form to the Daniels planer except that it used a cylindrical cutterhead. The board to be planed was held by a clever dogging arrangement on each end. Instead of presser bars, which have the undesirable tendency to push the board flat before it is planed, Gray's planer had a cutterhead designed to prevent the board from lifting up as it was being planed. Gray and another Boston machinist, Solomon A. Woods, formed Gray & Woods to manufacture the planer. Gray's design must have been commercially successful because the patent was both extended and reissued. The partnership lasted until 1873 when the firm became known as the S. A. Woods Machine Co.